Shredding old paperwork—it can be a daunting task for businesses and homes alike. Whether you have been storing your obsolete, personal documents in the garage for years or have boxes full of private, work documents strewn around the office, gathering and disposing of old files can be a chore. At Shred Nations, our mission is to provide you with the answers and tools you need to make smart decisions about your document shredding needs. This article will answer the most common questions we receive about shredding. The better question might be: what don’t we shred? Although shredding companies generally focus on shredding paper, they are more than capable of shredding plastic, fabric, and even metals. Materials only need to be shredded if they contain sensitive information, but many people forget about sensitive information stored magnetically or electronically. Fax machines and scanners store copies of the items sent through them, and anything with a name, date of birth, or any piece of personal information needs to be thoroughly destroyed to avoid the potential for identity theft. What About Staples and Paperclips? Now that you know what you can shred, you might be wondering how to prep your materials for shredding. Fortunately, since industrial shredders can shred all types of materials, you don’t need to sort or organize your documents at all before destruction. You don’t have to remove staples, paper clips, binder clips, or folders—just toss your documents as they are into a secure shred console until they are ready for shredding. What exactly is a shred console? A shred console is a locked bin where you can store your documents until they are shredded. If you sign up for regular shredding services you can store these secure bins throughout your office to gather papers in until the next scheduled shredding date. 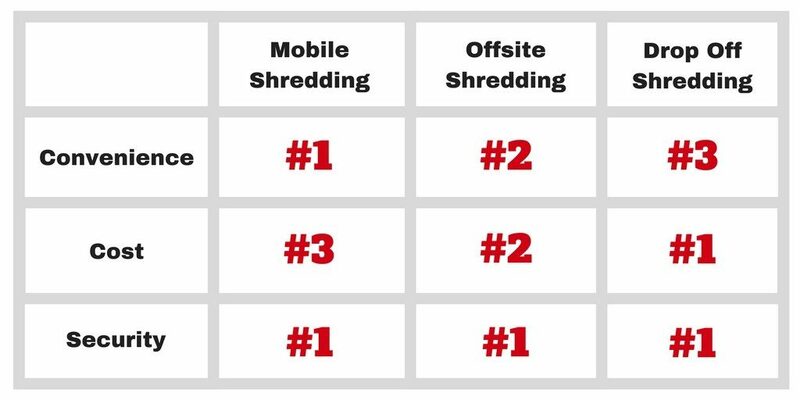 Which Shredding Service Best Meets My Needs? Mobile shredding is the most convenient shredding service available. All you need to do is gather the papers you need shredded, and the shredding company takes care of the rest. A shred truck is driven to your location, the shredding professional feeds your files through the shredder on the end of the truck, and the shredded remains are driven to a secure facility to be baled and recycled. The average price for this service is around $120. The only difference between mobile and offsite shredding is that the offsite option shreds your files offsite at a secure facility. With this service your files are picked up from your location, but you don’t get to watch as the shredding is done. Instead your files are taken to a secure facility housing a large industrial shredder where your papers are mingled with thousands of other documents and quickly shredded. The average price for this service is around $100. This service option is designed to meet the needs of low volume shredding projects. If you have 30 lbs or less, having a shredder come to you is not cost-efficient. But drop off shredding locations are all over the US—find one near you with this location tool. The average price for this service is around $1. Can I Just Buy A Personal Shredder Instead? Personal shredders retail for anywhere from $15 to $200+ and they can be an enticing option for individuals and small business with just a few pounds of paper to shred a month. Unfortunately, cheap shredders break easily and have short life spans. If you are willing to spend upwards of several hundred dollars and perform regular maintenance on your shredder, you’ll be more likely to own a shredder than can handle your needs for about 10 years. But beware the downsides of owning your own shredder. Depending on the volume of paper you have to shred and the amount of time you are willing to spend shredding your files, a personal shredder might work for you. But remember to consider the long term costs associated with owning a home shredder. What Happens to the Shreds? 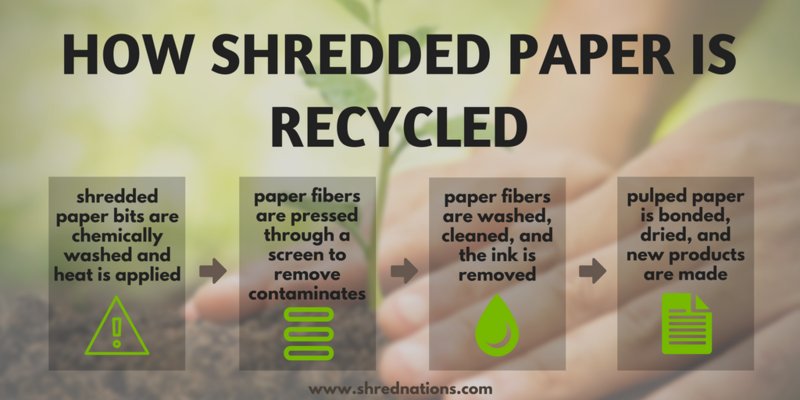 When you shred paper in a small personal shredder, you’ll end up with a couple of pounds of shredded paper that most recycling services won’t accept. Fortunately, when you go through a shredding company, they produce enough shredded paper that they can bale it and send it off to recyclers to have the paper bits reused. When you use a shredding service provider your shreds will be recycled, which is not only good for the environment, but adds another layer of security for your shredded materials. Ready To Shred Your Files? Shred Nations partners with document shredding service providers across the US. We can connect you to shredding professionals in your area who can meet your needs. For free quotes on shredding services near you, call us at (800) 747-3365 or fill out the form on the right.